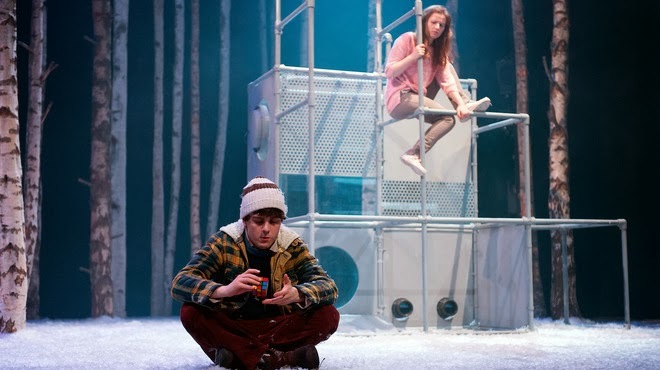 The rumours are to be believed — the Apollo Theatre will be making its comeback staging the West End transfer of Let The Right One In. The London theatre will reopen its doors on 26th March following the disastrous accident back in December where part of the ceiling collapsed, injuring 76 audience members. It will be the new home of the National Theatre of Scotland’s acclaimed production of Let The Right One In. The transfer will mark the show’s West End debut after a highly successful run at the Royal Court Theatre last year. The vampiric production is based on the horror novel by Swedish writer John Ajvide Lindqvist, which also received two movie makeovers in 2008 and 2010. Oskar, a bullied young boy, develops a deep relationship with a girl named Eli after series of brutal murders occur in their neighbourhood. When Oskar discovers the truth about Eli his loyalty is tested to its limits. A number of audience-encouraging initiatives have been introduced; there will be no per-ticket booking fee, £21 tickets will be available for theatregoers under the age of £21, and matinee tickets will be available from £15. The show’s producers, Marla Rubin Productions and Bill Kenwright, are eager to ensure the show attracts a wide range of audience members. The South Bank Sky Arts Award-winning will also feature a redesign to extend Christine Jones’ atmospheric set. Do you think the Apollo Theatre has let the right one in for its reopening?